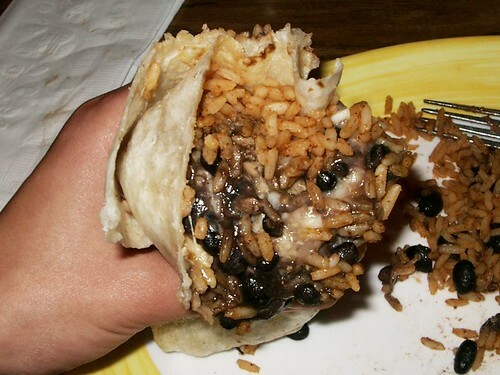 Yeah, you need a fork and knife to eat the Jamacian Jerk Chicken burrito, and $10.25 to buy it. Save your dollars and your flatwear. This Blockhead's meal was rated: 2.0. 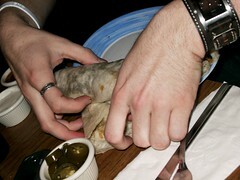 Blockhead's doesn't wrap their burritos; they fold them. And that just didn't sit right with the boys. Sterling logged many hours at Taco Bell some years back, and performed some hand modifications to turn that chicken filled flop into a burrito. That's right. A Taco Bell retiree shows these blockheads how it's done. This Blockhead's meal was rated: 2.2. 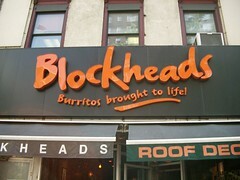 With six locations in Manhattan, Blockheads is one of the most well known NYC burrito spots. While well known, I didn't really get the word - Blockhead's has table service. It's more of a restaurant, and the prices prove it. 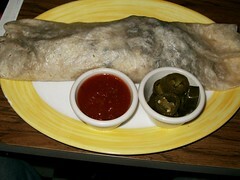 The burritos start at $7.75 for the veggie and climb to $12 for the fish fajita burrito. I prefer places without waiters, but hey, they do have a liquor license. Their site is pretty nice, and they've got an endearing obsession with sock puppets.